During the winter months and prolonged wet weather spells algae can settle within the fabric of artificial surfaces. Drainage is rapidly affected, creating a condition where the algae will thrive. If the weather is particularly wet the sand aggregates, leaving the surface unusable. Major maintenance becomes necessary. If applied in time AlgoClear will prevent deterioration of the drainage. It is by far the most cost effective solution for the maintenance of artificial grass. Watch the algae and the moss will look after itself. The upkeep of artificial grass for the owner is mainly about algae and moss control. Keeping the algae in check is the best way to avoid premature grooming work. This is easily done using a sprayer or simply a watering can fitted with a fine rose. The philosophy is the same for undressed or sand filled systems. Keeping the filling loose retains the playability of the surface as well as the self draining characteristics of the system. When do I need to treat? After a long period of wet weather: The spring is a good time. In winter algae develop slowly in the depths of the carpet. As the weather warms up algae multiply along the filaments. In the autumn, the alternate warm and wet spells may justify a second treatment. At other times of the year upon visual inspection: A week of rain is sometimes enough to render some surfaces slippery even when the drainage is satisfactory. The site exposure to the sun considerably influences the need for maintenance. AlgoClear or AlgoClear -Pro will kill algae within 24 hours. If the substrate is treated in time, no other action is required. The dead algae will be washed away through the drainage layer below. If the contamination was heavy, drenching with a conventional garden hose a little later will help in removing the remaining dead material. Moss demands more work. Remove the bulk of the moss. After the application of AlgoClear, the remaining material will turn brown and lose it’s fibrous cohesion. Moss will disappear at varying rates. This depends on the species and the time of year. In cold weather the process takes a little longer. The area can be swept with a bristle broom. A good wash with a garden hose will complete the procedure and clear the holes in the latex backing. How much product do I use? Artificial grass exposes a lot of surface if the surface of filaments is taken into consideration. A m2 of carpet becomes several m2 of exposed polypropylene, and the application rates for hard surfaces needs to be increased accordingly. For the new owner an initial test may be needed to determine the amount of dilute to be applied, depending on the depth and density of the pile. An initial procedure would consist of spraying or watering a small measured area at a rate of 2 m2 per litre with the view to soak the pile and take a judgement as to whether 2 m2 per litre is the right rate. At such a rate 275 litres of mix will be required, for a tennis court, so a small test first is worthwhile. The test can be carried out using fresh or slightly soapy water. Sand filled systems have less exposed material, but the sand requires drenching nevertheless. The amount of dilute required can be determined with a similar procedure. How do I determine the concentration? The concentration for algae will suffice for most applications. 1 to 14 for AlgoClear, 1 to 50 for AlgoClear-Pro. If the treatment is needed for the rehabilitation of a heavily soiled carpet, consider 1 to 12 and 1 to 40 respectively. The temperature of the substrate is important. The active in AlgoClear – a quaternary ammonium – becomes more active in warmer temperatures : the efficacy at 20o C is twice that at 10o C. A warm late afternoon is therefore preferable to a fresh early morning. Keeping artificial grass clean is simple if done in time. The wire mesh fence (in the shade), posts, and furniture within the compound will if kept clean prevent seeding fresh algae onto the cleaned surface prematurely. Excessive drift spray is best avoided on planted borders and over natural grass. A deep pile roller becomes handy for the task. 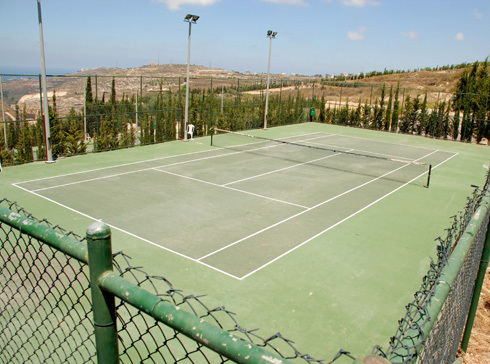 One of the major uses of AlgoClear is for tennis court maintenance. Most tennis court surfaces are rapidly degraded by jet-washing. AlgoClear increases significantly the life expectancy of the court. The microbiocidal properties of AlgoClear will ensure that not just the visible contaminations are removed, but also pathogenic agents such as E. coli, streptococci, staphylococci etc. and generally all that can be brought under a shoe sole. This deep cleaning contributes to the durability of the treatment. At standard dilution and application rate, a 10 litres can will be enough to treat a full-size tennis court completely. All exposed timber, including vertical cladding, is eligible for algae/lichen contamination. After an initial period of exposure, the natural chemicals imbedded in the cellulose degrade and are washed away. The surface becomes grey when bare cellulose needles are exposed. This surface becomes a natural habitat for algae, then later moss and lichen. The only realistic way to maintain the grey surface on a naturally bleached wood surface is to sterilize it as and when the green sheen appears. It is also a good approach to wood preservation. AlgoClear will perform this without damage to the environment. Warning: If the decking has been allowed to become too slippery, a brushing may be necessary prior to spraying. AlgoClear will, however, be sufficient to maintain a safe surface. AlgoClear is environmentally friendly, has accreditation for both amateur and professional use and produces excellent results on a wide range of surfaces such as patios, tennis courts, sport surfaces, timber walkways, glass houses, brick, tiled roofs etc. Moss and algal growth on footpaths and patios cause major injuries each year. Protect your family and friends by making your outside home evironment safe with AlgoClear. AlgoClear is invaluable for the maintenance of paved areas. Small lumps of moss often settle in the joints. Jet washing displaces the sand filling in the gaps. The displaced sand has to be removed and replaced : Maintenance becomes expensive. One application a year is usually enough when green algae is the problem, every few years only to stop moss growth.